Love's a Fantasy (f. by Street Sense). 3 wins to 1400m, A$167,075, ATC Turf Club H., 2d ATC Sporting Chance Golfers H., TAB Rewards H., McGrath Estate Agents H., 3d ATC Staff Recognition Day H.
True Prince (g. by Not a Single Doubt). 2 wins at 1350m, 1400m, 3d Ipswich TC Springfield Panthers Junior Rugby League H.
HONOUR CODE (Marscay). 8 wins-1 at 2-from 1100m to 1800m, A$140,250, SAJC Adelaide Hilton Cup, Gr.3, Lord Mayor's Mile H., L, Prettejohns Plants H., Ansett Australia H., BP Keeps You Moving H., Never Undercharge H., STC Springwood 2YO H., 2d SAJC Lleyton Hewitt H., Axinite H.
FLAMBERGE (Exceed and Excel). 11 wins-2 at 2-to 1200m, A$1,851,580, SAJC Goodwood H., Gr.1, MVRC William Reid S., Gr.1, MRC Oakleigh P., Gr.1, VRC Standish H., Gr.3, ATC Sebring S., Gr.3, MRC Heath S., Gr.3, SAJC Durbridge S., L, VRC Living Legends H., MVRC Programmed Property Services 2YO H., 2d MRC Rubiton S., Gr.2-twice, MVRC Ian McEwen S., Gr.2, VRC MSS Security S., L, 3d MRC Kevin Heffernan S., Gr.3, VRC Bob Hoysted H., L.
SUNBURNT LAND (Scenic). 8 wins from 1100m to 1700m, A$379,000, MRC Caulfield Sprint H., Gr.2, VRC Straight Six H., L, MRC Hussonet Cup, Grange H., 2d MRC Magari H., 3d VRC Patinack Classic, Gr.1, Seppelt Salinger S., Gr.2, Scalzo Food Industries H.
DURENDAL (Medaglia d'Oro). 8 wins to 1400m, A$891,300, to 2018-19, VRC Standish H., Gr.3, WATC Colonel Reeves S., Gr.3, 2d Northam RC Northam S., Gr.3, 3d WATC Winterbottom S., Gr.1, VRC Gilgai S., Gr.2, WATC Roma Cup, Gr.3-twice. CURTANA (Exceed and Excel). 6 wins-2 at 2-at 1000m, 1200m, A$652,600, VRC Red Roses S., L, Straight Six H., L, 2d VRC Coolmore Stud S., Gr.1, MRC Caulfield Sprint H., Gr.2. Producer. SWORD OF LIGHT (New Approach). 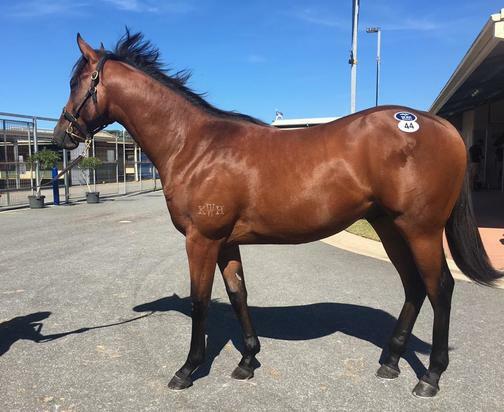 5 wins-2 at 2-from 1000m to 1600m, A$654,250, to 2017-18, VRC Let's Elope S., Gr.2, MRC Blue Diamond Preview (f), Gr.3, Vobis Gold Reef, Buyaracehorse.com.au H., 2d Bendigo Guineas, L, MRC Brian Reckas 2YO H., 3d MRC Thousand Guineas Prelude, Gr.2, Bendigo JC Golden Mile, L, VRC Mrs Mac's Family Bakery Sprint, 4th VRC Hilton S, L.
COUNTRY LODGE (Grand Lodge). 2 wins at 1400m, A$306,100, VRC Vanity S., Gr.3, Beachside H., 2d VRC AV Kewney S., Gr.2, Sky Channel H., MRC Deakin H., Jim Conway H., 3d VRC Chubb S., L, 4th MRC Angus Armanasco S., Gr.2, VRC Let's Elope S., L. Producer. SATURDAY SKIES (Any Given Saturday). 9 wins-2 at 2-from 1000m to 1800m, A$277,591, to 2017-18, WATC JC Roberts S., L, Vinnies & Rotary Partnership 2YO H., 2d WATC Magic Millions Perth 3YO Trophy, RL, 3d WATC TJ Smith Trophy, L.
DOUBTFUL JACK (Not a Single Doubt). 9 wins-1 at 2-from 1000m to 1600m, A$717,128, VRC Bobbie Lewis H., Gr.3, Winter Championship Final H., L, TTC Premium S., L, VRC Brian Beattie H., 2010 VRC-CRV Winter Championship Heat H., MVRC Pulse Pharmacy H., 2d MVRC Schweppes S., Gr.2, 3d MVRC Australia S., Gr.2, MRC Kevin Heffernan S., L.
SINGLE STYLE (Not a Single Doubt). 3 wins-2 at 2-at 1200m, A$177,530, ATC Keith Mackay H., L, Rosehill Gardens H., Australian Turf Club 2YO H., 4th ATC Wenona Girl H., Gr.3.